Just trying to squeeze in some television between mothering, working and crashing. My friends are so cool! I am proud to unveil the new and improved Laptop Television Mom. Please visit my new site -- LTVmom.com -- where I am still trying to squeeze in some television between mothering, working and crashing. Endless thanks to my friend at Metafluence, who is the mastermind behind the design and improvements. Sept. 30 is a very special day in our house. It's my daughter's birthday, and this year we celebrate FOUR wonderful years of parenthood. I can't wait to help my little girl blow out four pink candles and remind her how much I love her! On a lighter note, I just have to say this: shopping for a four-year-old girl's birthday is a blast. I might have gone a little overboard, but she is getting practical gifts (new jeans and a Fall jacket) and the totally impractical (pink junior golf clubs and a new Barbie doll). All are wrapped in pink Princess paper, and I hope all are enjoyed. 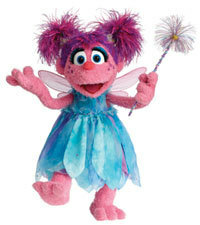 There is one more special gift on the way, the newest Sesame Street DVD called"Abby in Wonderland" featuring the adorable Abby Cadabby, which is available on Sept. 30. I was lucky enough to get a preview copy at this year's BlogHer conference in San Francisco. (Wrote about the amazing Sesame Street suite HERE.) If you need a gift for a little one who loves pink fairy wings and has a vivid imagination, you can't go wrong with Abby's latest adventures! Listen up, LTV Husband! Here's how I want to celebrate my next birthday! NEWS FLASH: In 2009, Come to a Disney Park on Your Birthday and Get In Free! Press Release Says: Everyone who visits a Walt Disney World Resort or Disneyland Resort theme park on their birthday in 2009 can get in free, as Disney Parks embraces a newly identified family-travel trend called "celebration vacations." 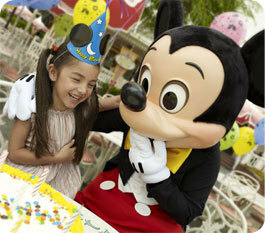 Disney parks are the ultimate setting for any celebration, turning a special occasion into a magical Disney experience. And with the opportunity of free admission to a Walt Disney World or Disneyland Resort theme park on your birthday in 2009, it's even more special. 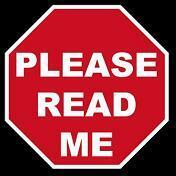 All it takes is a valid ID including proof of birth date. Guests can get more details and start the process by registering their birthdays at www.disneyparks.com. LTV Mom Says: Book my plane ticket now, I'm going to Disneyland in February 2009! Here we come, Mickey! Many of my fellow bloggers from New York City Moms Blog and New Jersey Moms Blog were invited to attend a taping of the Martha Stewart Show on Sept. 17. One of them -- Deborah from Jersey Bites -- even made a guest-appearance on the Food Channel Blog. You may know her from TLC's While You Were Out and Trading Spaces, but the the bloggers at Graco sat down with her for this Q&A on their blog. Very cool, Erin! Brilliant. I love Tina Fey and Amy Poehler... and, even though I make a point not to blog about politics, I am (still) a Hillary Clinton supporter. If you happened to miss the SNL skit with Tina Fey as Sarah Palin and Amy Poehler at Hillary Clinton, click HERE to watch the clip. In addition, a great recap and transcript can be found on the Silicon Valley Moms Blog, written by my friend at Techmamas.